Probably not the best of ideas to commit to helping a friend do wild flowers for a wedding in the week leading up to my exhibition, but I just couldn’t resist it. I was flattered to have even been asked!. Sarah is so wackily impulsive and spontaneous in her flower arranging. It all depends on what is available. 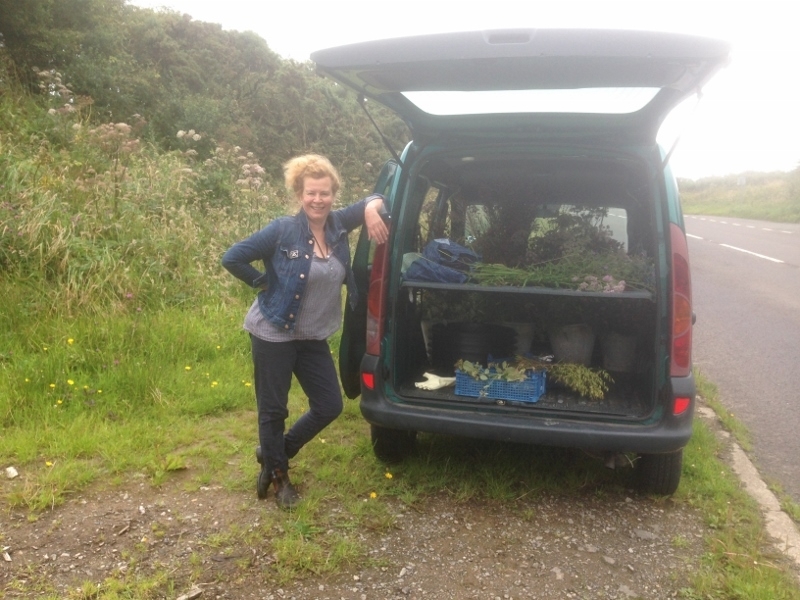 She arrived with her little van full of buckets of water and we ambled around the lay-bys and lanes of North Cornwall occasionally jumping over gates to pluck some elusive wild flowers we spotted. Her business is built around using all wild flowers within a few mile radius of the wedding and as she was coming down from Bath, I managed to do a bit of a recci to source the best spots and also get the permission of a local farmer to have some of the thousands of wild rosehips and flowers down Maer Lane. Looking into the hedgerows in the height of summer, the variety of wildflower is amazing. Some are better for cutting than others. It is probably why most florists don’t use them, because they can wilt very quickly. So armfuls of wild flowers were quickly plunged up to their necks in water and then stripped, trimmed and conditioned overnight to have a good drink before they would be arranged the next day. We spent the whole of the next day recreating a hedgerow scene on a pedestal as well as making and creating three large circular head dress chandelier style hanging arrangements to wrap around the poles of the wedding marquee. Little dainty corsages for all the groomsmen and jars of wild roses and more armfuls of wild clematis were taken to the venue and we had little over an hour to get it all done!. Safe to say, I haven’t worked so far for ages. It was totally knackering but Sarah with her opera singing and general theatrical antics made it the a very memorable event. It didn’t look bad either and I am totally hooked on using wild flowers. Sarah’s card was equally epic! 😉 Basically… thank you and I would have been totally f….ed with out you. lol. 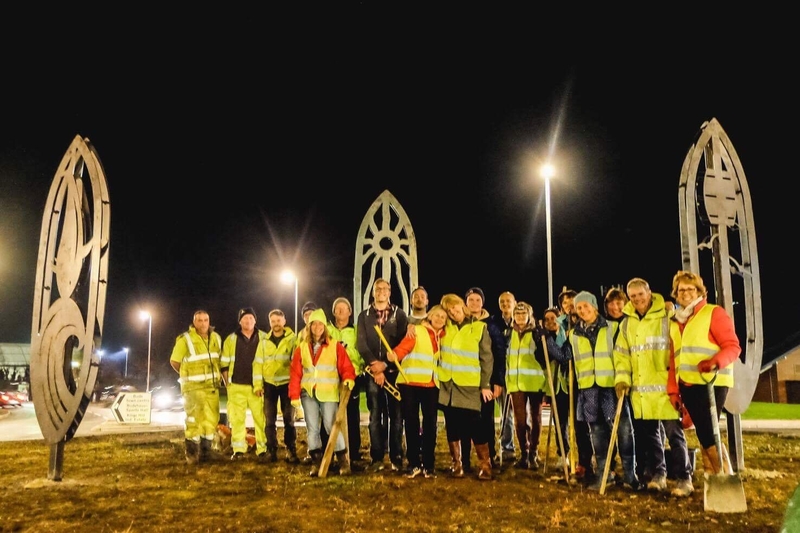 The roundabout coming into Bude has never looked very inspiring and when the council removed all the planting in 2016, close friend Jane and I saw our opportunity. We had always joked about wanting to guerilla garden it and give it a make over. Building had started on the massive Bovis Shorelands estate and with that came the other evil of an out of town shopping centre. It seemed even more important now to claim this roundabout and make it unique and reflect Bude and the town. We shunned sponsorship which would come with corporate signage and working with the local highways, Cormac Cornwall, the Bude Stratton Town Council and a small band of volunteers, we came up with a plan and designs. Originally we were going to have them made from wood, but after a chance conversation at a wedding with Clive Woodward who owns a large company in Bude, we had an even better long lasting larger offer of steel fabricated sculptures which would rust over time and set in beautifully. Over the period of a further 6 months, the designs were finalised based on Jane and I’s original drawings. We wanted surfboard shapes to reflect the culture of Bude and the sea and each one had a cut out. A wave with a fish on the top, a sunshine as Bude regularly tops the charts for most sunshine and the iconic barrel rock. They weighed in at a whopping 180kg each. Some local guys from the gym offered to help and unofficially some of the local highways guys came after work to lend a hand. Health and safety was a priority but we didn’t have time to go down all the regulatory routes, so it was hi vis jackets, torches and lots of care to halt traffic on the roundabout. We prepped it, laid down matting, made support holes and spread several tonnes of stone and chippings over it. It’s only when you are up on top of it, you get a sense of how big it is. The transformation seemed to happen overnight and the next morning, there were calls from Radio Cornwall, the newspapers and lots of tooting and whooping from passers by. We never did get a chance to publicly thank everyone involved. Life took over with family commitments and work. So a big thank you to anyone who may be reading this. Our volunteer group, Annie, Kim, Sarah, Tim, Karen, Deb, Liz, Sharon, Stu, Roger and Geraldine. Brommells for advice and expert driving skills to deliver dumpy bags of materials. Cormac and local highways for always coming up trumps . Councillors Pete Labroy, Nigel Pearce, David Parsons, Bob willingham etc. and of course to Clive and David Woodward and their team from Bott Ltd for organising, making and getting the project to fruition. And to the public who supported our crowdfunding actions and also tooted as they passed or dropped off plants, drinks and cash. In March 2018 we added some planting. As a footnote, in November 2018 Jane and I were nominated Bude Hero’s and received an award for the work we had done to improve the nature of the entrance to Bude, claim it as our own and the whole project cost less than £1500. Port Eliot Estate, St Germans Cornwall is one of my favourite places. It has buckets of history and even more charm. As part of culture24 and museums by night events held all over the country, Port Eliot opened its door to the public to view the house by candlelight and to say it was magical was an understatement. We have seen the house before in daylight and have been to the annual festival every year but one. At last nights event it was an absolute delight to wander the grounds on a sunny May evening when it was so still and even better empty. It made me reflect on what it is about this place that so touches a chord. For starters the house on the outside is not particularly beautiful, probably due to its lengthy history and little changing over the centuries. Although the river was diverted from the times of the monastery when Repton developed the landscape around the house, it feels at one with nature and sits in the valley and blends into the fields and backdrop of trees and woods. The tide was out and the wide estuary of the Lynher sweeps down to meet the Tamar in a small channel exposing mountains of glistening silvered mud. The sky reflected in the river as it takes its narrow sweep at low tide, but at full tide it can come brimming over the edge and into the fields. The woods were bathed in a golden glow carpeted with bluebells, dandelion heads ready to blow and the last of the wild garlic. Apart from the untouched and natural, Port Eliot has beautiful gardens too, but they are to the back and up on the hill. It is a large estate! Another defining feature is that what I would deem to be the front has no grand entrance. The entrance is tucked away on the side, with the drive coming in behind the church. The more sheltered south side of the house has a stunning wisteria which was in full bloom and created a lilac haze as the light faded. It must have one of the largest churches only metres from the house dating back to the monastery days, but nothing forboding about it … more a place of sanctuary. We went to see the interior by candlelight. So what was it like?.. serene, calm, warm and sparkly. Walking in I half wondered if they had given into health and safety and used battery tea lights, but no; the house was filled with tealights, candelabras and candlesticks galore. If you had gone to see the Joshua Reynold paintings, you might have been disappointed, but the patina of the furniture and the depth of colours in the decor took on a life of their own in the half light which was helped by the glow of burning log fires. Different quirky things came to light as others were plunged into darkness with a plethera of elephants in all forms everywhere. ( the family emblem). The round room in particular has to be one of England’s treasures now. As I am writing I hope you getting the sense of how homely this place is but it’s also filled with history and its own treasures. Along side objects of history are elements from the current families lives including surfboards, family photos and a harley davidson motorbike full throttle in the round room. The round room takes your breath away. No one can hide in a corner; everyone faces in and the walls envelopes you with its Robert lenkiewitz mural. In parts not finished as he died, but painted over 30 years it is incredible in its detail and luminosity of painting which is helped by the biggest sparkling chandelier in the centre of the room. I have tried to put into words how this place makes you feel. I think my judgement is slightly informed by the family that live there; friendly, unassuming and creative . You have to go and visit to see for yourself. 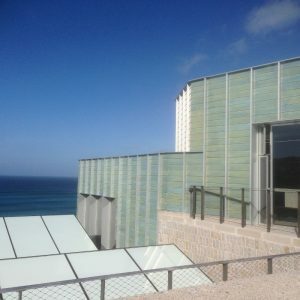 Some of my images would not translate from my iphone to the blog. Grrr! ; but you can view the full image gallery on my facebook page here.